Do students score exact expected marks in CBSE board exams? Or do they secure above or below that? These are few obvious questions that are asked by the examinees. It is a fact that, students of class 10 and class 12 often complain and question about marking scheme of CBSE board after the result has been declared. In this article, we will go deep and get to know how CBSE class 12 answer sheets are evaluated. We will also know what points students must include while writing an answer for scoring maximum marks in CBSE board examinations. We will also know about all the important factors using which you can do an analysis of your score in CBSE board examinations. You will also learn other useful tips to score maximum marks in CBSE class 12 board exams 2019. To begin with, first, let us understand CBSE paper checking process and pattern. After the completion of CBSE class 12 board examinations, the board hires experienced teachers from various CBSE schools to evaluate answer booklets. The board provided short documents to the teachers involved in the evaluation process. Besides important guidelines, these documents detail about the Marking Scheme. 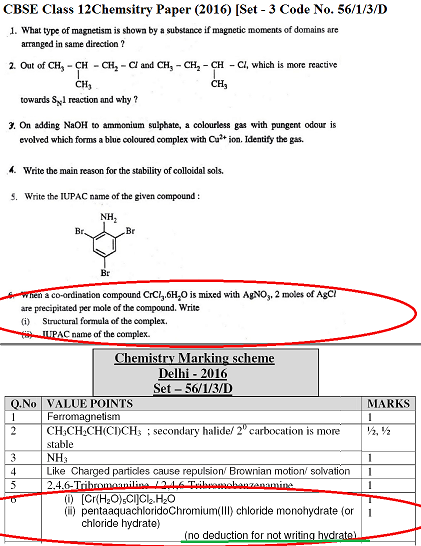 In the above image, a part is taken from CBSE Class 12th Chemistry 2016 question paper and another part is taken from CBSE Class 12th Chemistry 2016 Marking Scheme (released by CBSE after board exams). Now, if the solution you had written in your answer booklet has all the value points (as provided in the marking scheme) then most likely you will get maximum marks or full marks. You will get a better understanding if you will carefully observe question number 6 and its solution. Analysis of CBSE marking scheme shows that the board takes step marking very seriously. This can be easily understood with the help of latest sample paper for class 12 maths released by CBSE for 2017 maths exam. 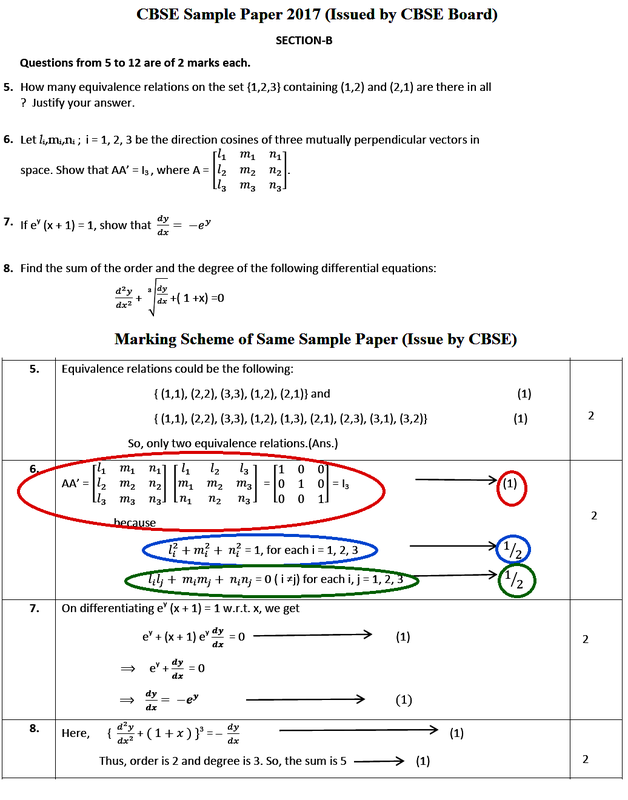 In the image given above, a part is taken from Class 12 Maths Sample Paper 2017 issued by CBSE and another part in the same image is taken from the marking scheme of the same sample paper provided by CBSE. If we carefully observe question number 6 and its answer (in marking scheme), we will find that there are three important steps which must be present in the complete answer. If any student has missed one of the steps (as given in marking scheme of question 6) then he or she will definitely lose marks. It doesn’t matter if his or her final answer is correct. Now, one may also ask what if the final answer is wrong and rests of the steps are correct? Well, in that case, you will get marks for all steps you have written (and of course, will lose few marks). Suppose the question is of 2 marks but you have written all the steps correctly but unfortunately the final answer is wrong then you may likely to get 1&frac12; marks out of 2. More than 10 lakh students will appear for CBSE Class 12 board exam 2017 which means that more than 10 lakh copies will be evaluated in a very short span of time (about two months). It is obvious to hint that the ratio of teachers is to copies is very-very less. Therefore proper representation of the answer will help you to score well! Also, a teacher gets a specific amount of money for checking a copy by CBSE. Naturally, every teacher wants to make more amount of money per day by checking more number of copies. Now, if the teacher finds an answer with all correct value points (as per marking scheme), underlined points, correct labelled diagram then the teacher will definitely give maximum marks to that answer. If someone has written a huge paragraph for 300 words with no headings, sub-heading, underlined words etc., then chances are there that he or she may not get good marks. It is another misconception among CBSE students. Generally, students think that if a term is asked in the board exam then, we must write more and more about that term. So, students start writing everything what they know about the term. They think that writing maximum words will fetch them more marks which is not true. Students will only get marks if they have included important points in their answer. If question is about fundamental principle of AC generator and student will only get marks for writing the principle correctly. All other points of the answer are irrelevant and will not add up to marks. If you are going to write CBSE board exams 2019 then you must go through marking scheme provided by CBSE. An ideal answer is the one which has proper heading, sub headings, labelled diagram (if required) etc. One is likely to get expected (or calculated) marks only if he or she has taken all above mentioned factors in account while writing the answers. In case if you are not satisfied with your CBSE result 2019 then students can apply for marks verification process after result declaration.